I recently was asked about the “schwazzing” technique for growing cannabis found in a $500 (yikes!) hardcover book called Three a Light by Joshua Haupt. So what is schwazzing? What does it mean to “schwazze” your cannabis plant? 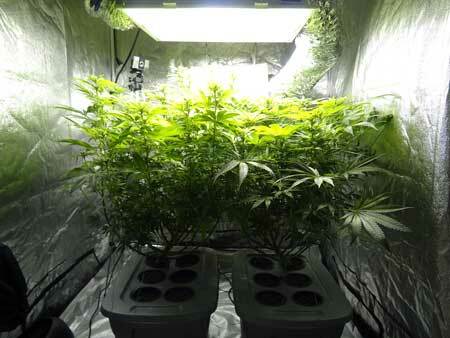 As it’s core, schwazzing is a variation of defoliation, a curiously effective technique for increasing cannabis yields indoors. 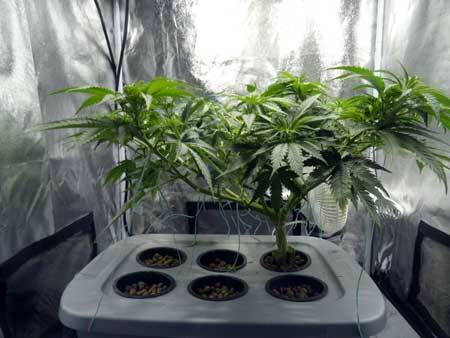 The idea behind defoliation is to remove fan leaves from your plant at specific times. As a result, the plant ends up producing bigger and fatter buds. Why does defoliation work to increase yields? No one knows for sure why cannabis plants react this way, but I have a few theories. Cannabis is a wind-pollinated plant, which means the only buds that would get pollinated are ones exposed to the wind. If you think about that, it kind of makes sense that buds would only develop if exposed to fresh air and a breeze. In the wild, it’s only those buds that would get access to pollen! Cannabis spends energy lengthening colas/bud sites instead of maintaining leaves during the “flowering stretch.” When you first switch your cannabis plant over to the flowering stage by changing the light schedule to 12/12, it responds with a dramatic increase in growth known as the “flowering stretch.” Basically, most cannabis strains grow like crazy for the first 2-4 weeks after the switch to 12/12. In fact, plants can double or even triple in height during this growth spurt. So perhaps if the plant doesn’t have any leaves to focus on, it just puts all that extra “energy” towards bud development. Reaction to stress during the flowering stage – Is it possible that intense defoliation causes some sort of defensive reaction during the flowering stage? If a flowering plant gets completely defoliated by bugs in the wild, it could die before it has time to make seeds. 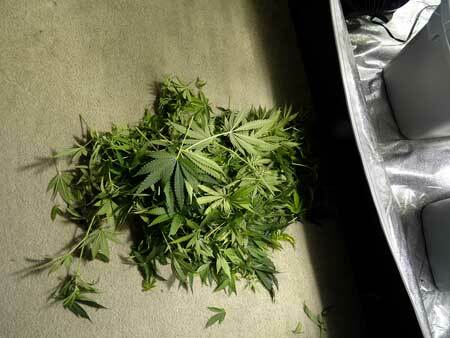 Perhaps the plant is responding to this emergency by going into “overdrive” as far as bud production. Just a guess! Did you know? Cannabis Isn’t the Only Plant! You may be surprised to learn that cannabis isn’t the only species of plant that rewards growers with increased yields as a result of defoliation. Some commercial crops including cotton need to be defoliated at specific times during the growing process in order to produce the best quality and yields. 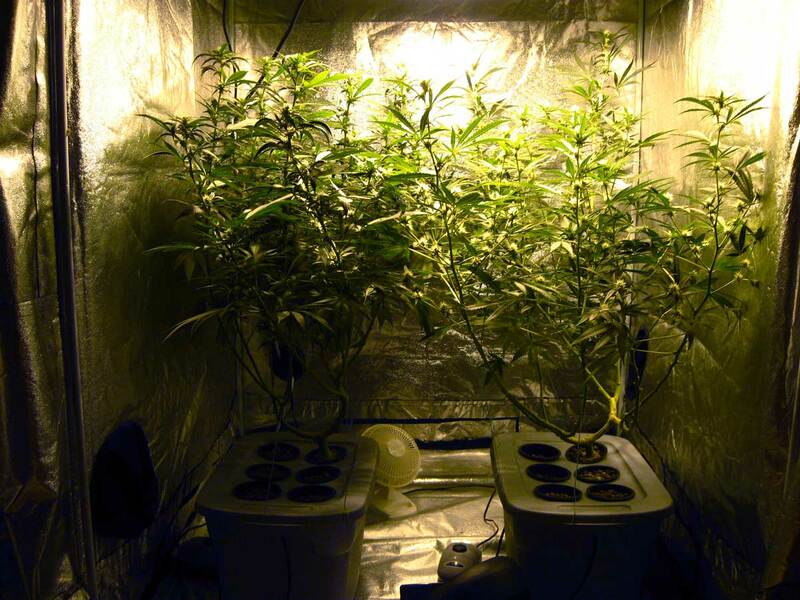 For various plant species including cannabis, defoliation takes advantage of natural plant processes to “hack” the plant into growing more bud than it would naturally grow in the wild. Even if we don’t fully understand exactly why the plant reacts the way it does, we can still use this information to our advantage! 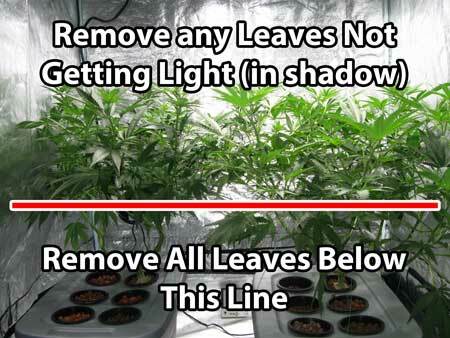 Right before the switch to 12/12, remove most of the fan leaves on your plant, especially the biggest ones. After – Notice how all the bud sites are now exposed, and the light can get to bud sites deeper down into the plant. Here’s the resulting pile of leaves and stems. Step 1B: On each cola, remove everything below top 2-3 growth tips (Optional) Only do this if you’ve trained your plant to grow flat and wide with many colas via plant training! 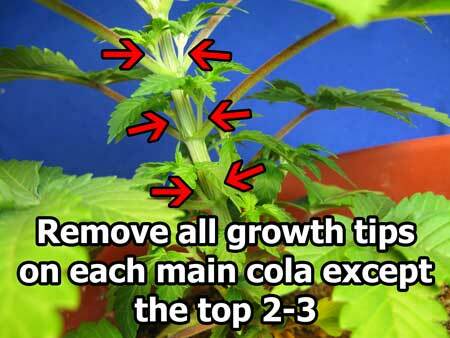 When I defoliate my plants at this stage I also remove all growth tips below the top 2-3 on all my main colas. This way the plant only focuses on those colas and doesn’t try to make any larfy buds to compete with the ones you’ve nurtured. 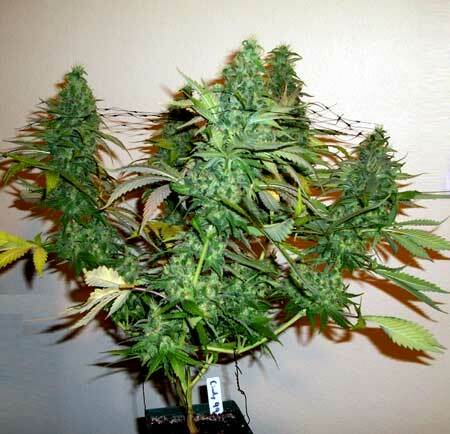 I’m not certain that this is taught in Three a Light as part of the schwazzing technique as this is more geared towards smaller indoor grows, but it will reward you with bigger and denser buds if you’ve trained your plants to grow the right shape. When a cannabis plant starts making buds, it makes them all over the plant – everywhere there’s a growth tip! (A growth tip is any new stem coming out of the side of another stem – these are always located at the base of fan leaves, and it is where all bud sites are located)! 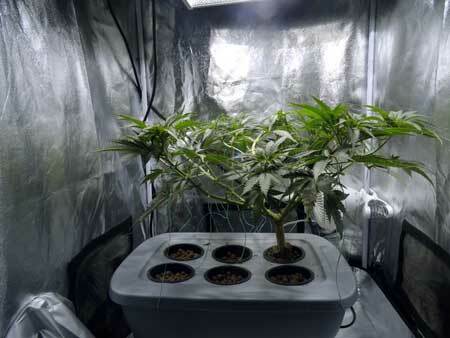 Bud sites that don’t get direct light will never fatten up, but they keep stealing resources from the plant. 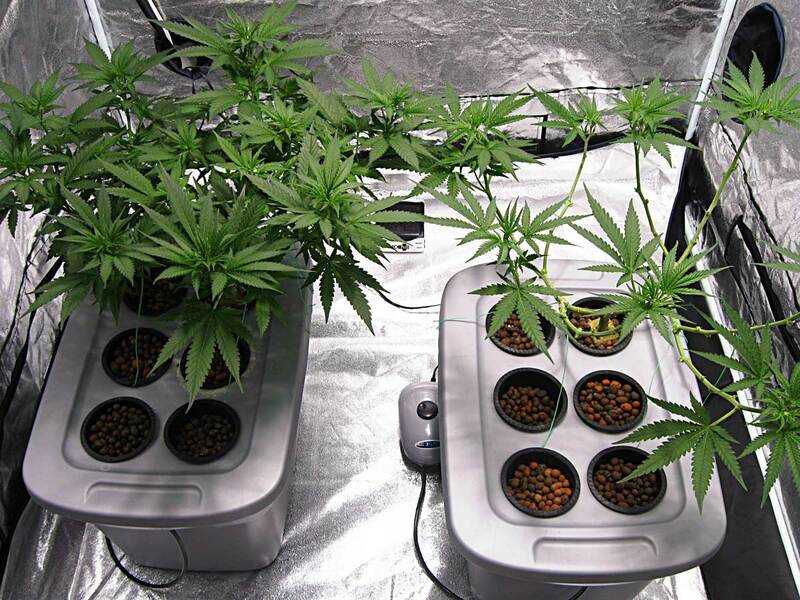 By removing them before the plant starts making buds, you’re letting the plant focus only on the buds that have a good position under the light instead of developing larfy buds lower down on the plant that ends up in your trim pile at harvest. 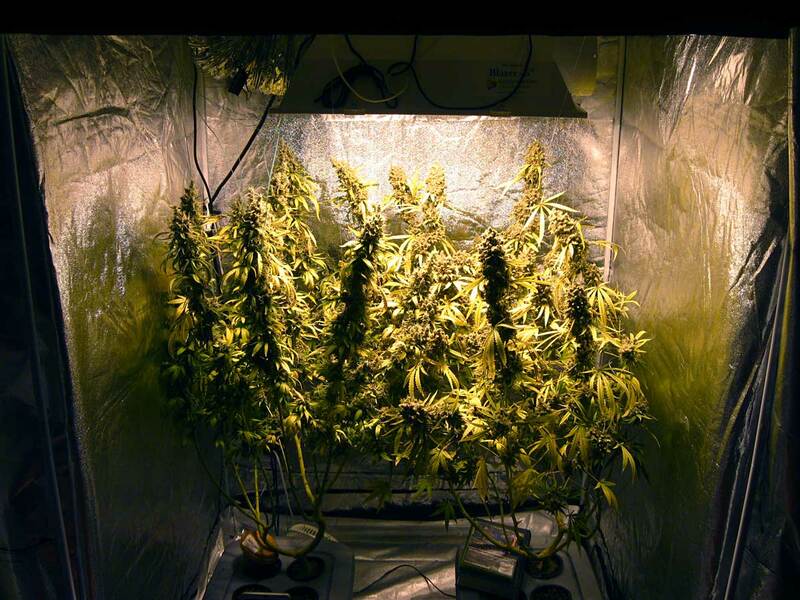 That is some pretty extreme defoliation, shouldn’t it hurt the plant? I wouldn’t necessarily recommend removing this much from your plant at once especially during your first grow because it could stunt your plant… but I can tell you that the plant on the right ended up yielding 12.6 ounces compared to 10.5 ounces for the plant on the left. It could be genetics or a million other reasons causing the difference in yields, but I think it shows how a plant can recover from defoliation if it happens towards the end of veg or at the beginning of the flowering stage. 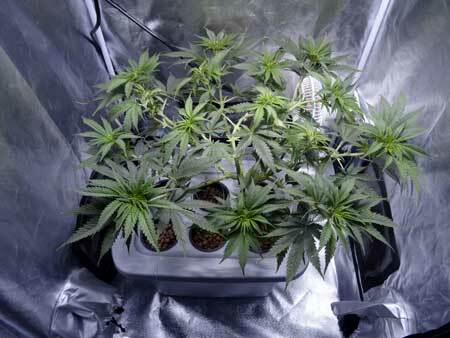 If your plant is a nice size and growing fast and healthy, it can take quite a bit of defoliation. Check out how those two plants developed in the pictures below in the next step. 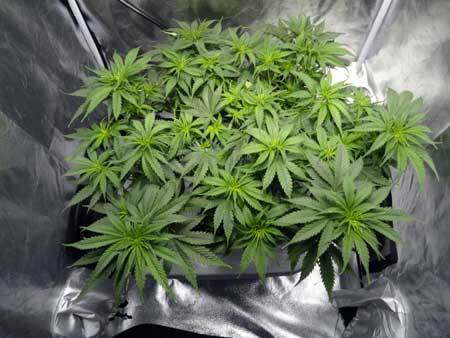 By the time it’s 3 weeks after the switch to 12/12, plenty of new buds should be forming. If the plant is getting bushy, defoliate the plant again around week 3 by removing the bigger fan leaves, and all the lower stuff that’s in major shadow. In general, I recommend defoliate lightly during the flowering stage after buds have already formed since you can always take more away but you can’t put leaves back. These next pictures show the progression of the two plants from above; notice how there is light going all the way down into the defoliated plant, while the left plant is mostly in shadow. All those hidden buds on the left won’t fatten up properly without being exposed to direct light and fresh air. After exposing all buds around week 3 they will start growing faster immediately (you will be able to see the difference). 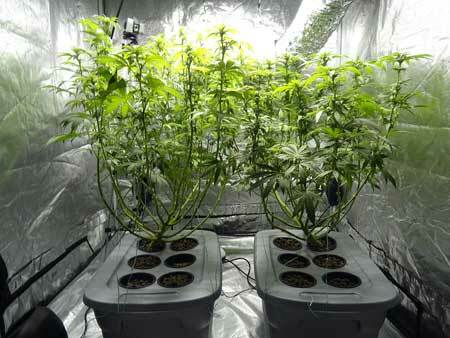 Week 3 of Flowering: Left plant needs defoliation while the right plant was just defoliated. No more major defoliation after 3 weeks of 12/12! As the flowering stage progresses, you may still prune away any small growth underneath that doesn’t get light, as well as big fan leaves that block bud sites and can’t be tucked away. Although defoliation (removing leaves) helps with better light penetration on bushy plants in the flowering stage, it’s important to remember that your plant won’t be making any new leaves after the first 3-4 weeks of 12/12. 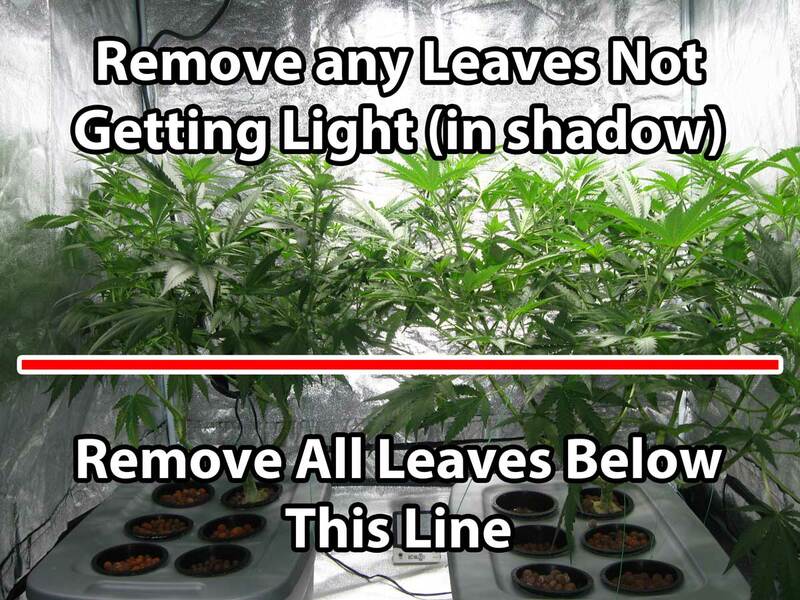 So you need to make sure to leave enough healthy leaves to last until harvest time! Why Week 1 & 3? These aren’t magic numbers; they are just general timelines that are known to work well for growing cannabis plants. 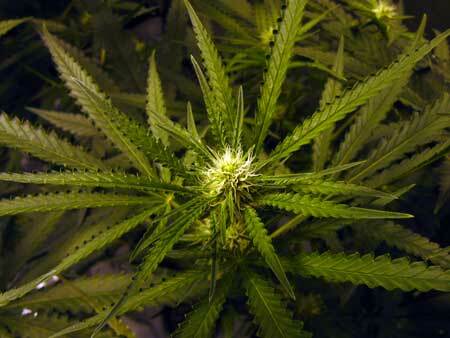 Cannabis can “re-leaf” itself during the first few weeks of flowering, but not later. If you defoliate later in the flowering stage, or take too many leaves earlier on, the plant will not be able to make new leaves to replace the one’s you’ve taken. By only taking leaves on Week 1 and Week 3, you get the benefits of defoliation while still giving the plant time to grow enough leaves to take it to the end of the flowering stage. This was just a mini-tutorial based on what we’ve learned from our grows to show the results we’ve gotten. Although I only have a very general understanding of what’s inside Mr Haupt’s book about schwazzing cannabis plants, it seems so similar to what we do at GWE that I wanted to share our pics and experiences. To get the original schwazzing tutorial straight from the horse’s mouth (and to see what else he talks about in his book), check out Three a Light by Joshua Haupt (available on Amazon). Also check out our tutorial on manifolding, which can be used together with schwazzing to grow multiple colas and possibly increase your yields even more!